With its Thinner vibes and painful brotherly discussions, “The Purge” was both physically and emotionally trying for viewers. Good thing we had some nice undercover get-ups to soothe us through the rough times. Before we get into the whole “Sam Winchester keeps breaking my heart” discussion, let’s talk about the case that brought the boys together and ultimately tore them more apart. Overweight victims having the fat just sucked right out of them, to the point of death? Sounds like a job for the Winchesters. I always like to see the boys play their various roles in order to get to the truth. FBI agents, teddy bear doctors, gym teachers, or fitness instructors — whatever the case calls for, Dean and Sam are willing to step up and act the part. This time around, along with fun undercover aliases, we got to see Sammy wearing a tank top and flashing his pretty muscles. Hey, I have priorities, after all. And I needed something nice to look at because every time he opened his mouth and discussed their crumbling relationship with Dean I wanted to cry. At least fighting a Peruvian Fat Sucker meant they weren’t fighting each other, right? After all these years, I’m always happy when Supernatural brings up a monster that the boys have never encountered before. How likely would they have run into a Peruvian creature while cruising the United States? Not very. But finally they can write it down in their journal that they fought a pishtaco and won. And, no Dean, triumphing over a fish taco is not the same thing. Also, kudos for once again showing that all monsters are not necessarily bad. The female had found love, had been living a quiet life where she was helping humans with their weight problems. She did not deserve to be killed just because of what she was. There are some good monsters out there, still. The boys just seldom ran into them in their early years. But the routine of the case and the enjoyment of being undercover did not erase the utter pain that the boys’ relationship continues to cause me and viewers like me. At this point, I’m having a hard time with Sam’s mindset, mostly because it causes Dean’s heart to keep breaking over and over again. This is a man who, back in Season Four, apologized to Dean because he tried everything to get his brother out of Hell and failed. He offered himself up, to trade places with Dean, if only he could release him from the torment. 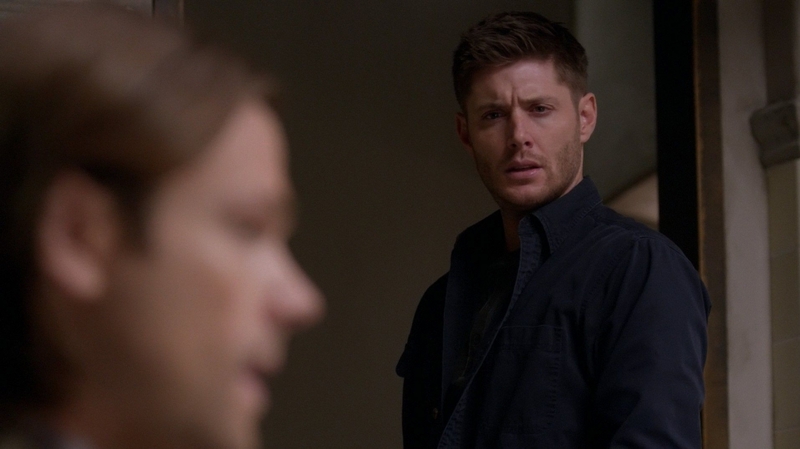 It’s a man who said back in Season One that some things were more important than the hunt, and he was looking directly at Dean when he said it. What happened to that commitment? Or were there always limits to how far Sam would go for his brother? Dean, for his whole life, has had no limits when it came to Sam. Dean would do anything for his little brother. He would sacrifice himself, and has done so on many occasions, as well as sacrificing anyone or anything around him. Anything that was in his power to do, he would do it for Sam. And that commitment has cost them both unimaginable loss over the years, because of the lack of boundaries Dean has. Yes, maybe some of that is an inability to live if Sammy’s dead. His co-dependence runs deep and it’s hard to watch at times, but it’s an ultimate truth. Dean Winchester’s life has always been revolving around the mission of “protect Sam.” The fact that we, and Dean, have to face the fact that Sam does not have those lack of limits when it comes to Dean? It hurts a lot. Dean has always believed it was a two-way street, that Sam would go as far to protect his brother as Dean would for Sam. The truth is that Sam wouldn’t. Or he can’t anymore. And therein lies the reason my heart hurts. Also, I’m hurting over what Sam’s honesty is doing to Dean. 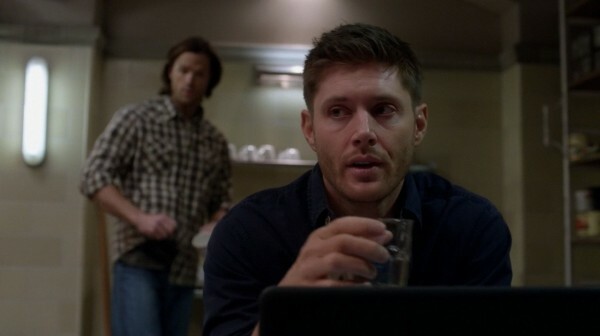 The man is an emotional wreck over what Sam has been saying to him, but to bust out and cry is not the Winchester way. No, Dean’s way of dealing with emotional pain has always been to numb it at the bottom of a bottle. The fact that he’s turning to this crutch yet again is hard to watch. I can’t recall if Dean has drunk at all since he returned from Purgatory. He was in enforced sobriety for over a year and he was raging alcoholic before his trip down under. But since they got the Bat Cave, a place to call home, Dean has been happier. He had purpose, he had his own room, and he had a place where he could take care of Sammy. After the rejection he feels from Sam, he’s right back in that dark place from before and I fear it’s going to be a hard fight to crawl back out again. Words hurt, Sam. They hurt a lot. And their broken relationship is weighing down on our hearts. Remember the good old days, when the boys were happy, on the road hunting monsters and being brothers? I miss those days. I miss them a lot.